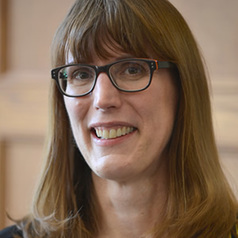 Assistant Professor Kristin Seefeldt’s primary research interests lie in exploring how low-income individuals understand their situations, particularly around issues related to work and economic well being. Currently, she is conducting research on families’ financial coping strategies and is a Principal Investigator of a survey examining the effects of the recession and recovery policies on individuals’ well being. Her most recent book, Abandoned Families (Russell Sage), explores the ways in which various institutions that once fostered economic security and upward mobility, currently fail low and moderate income families, particularly families of color. She is also the author of Working After Welfare (W.E. Upjohn Institute Press), which discusses employment and work-family balance challenges among former welfare recipients, and a co-author of America’s Poor and the Great Recession (Indiana University Press).